Google Now was first introduced back in Jelly Bean 4.1 and is definitely one of the most interesting aspects of the Android OS. Simply put, it's Google's version of a personal assistant. Google Now is in the same neck of the woods as Apple's Siri, but it learns constantly from your daily routines. It's accessed by holding the home button or through the Google Search app. Google Now gives you short overview of information it believes is relevant to you right now in the form of cards. Going to work in the morning? Google Now knows this and lets you know there's a big traffic jam on your usual way to the office, so it offers you a re-route. Google Now, if you allow it, can scan your email for upcoming flights, deliveries or restaurant reservations and let you know when they are due. There are also numerous kinds of cards like birthdays (yours and those of your contacts) and what distance you've walked in a particular month. The last one could definitely feel creepy for some users, but it's easily turned off from the Google Now settings menu. Google has also integrated Voice Actions into Now. They can handle stuff like sending messages (SMS or email), initiating a voice call, asking for directions, taking a note or opening a site. Google Now can also launch apps, check and manage your calendar and look for nearby places of interest and stuff like movie openings in theaters. All you need to do in order to initiate Google Now's voice actions is, once you've opened the app, say OK Google and start commanding. One big advantage of Google Now is that the voice typing functionality doesn't require an internet connection to work. You can enter text by speaking anywhere you can use the on-screen keyboard - be it the Messaging app or a note taking app - without the need for a data connection as long as you have pre-downloaded the needed language packs (and those only take about 20-25MB of your storage per pack). Making voice typing available offline also made it faster as it's not dependent on your connection. What's even more impressive is that the transition hasn't cost it anything in terms of accuracy. You can now set reminders straight from Google Now's UI. Just hit the bottom left icon (the palm with a stretched index finger). There you can add reminders or just check all the past, ongoing or upcoming reminders. 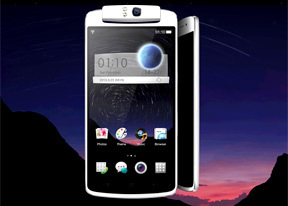 The Oppo N1 comes with a Snapdragon 600 chipset, which is not exactly top of the range any more. The Snapdragon 800 is already powering a dozen flagships, while its Snapdragon 805 successor is just around the corner. Not that four Krait 300 cores is something to frown at, but they don't allow for the same instantaneous loading times or stuff like 4K video recording. So let's dig right into it. Starting off with BenchmarkPi and Linpack. Both focus on the processing skills - BenchmarkPi evaluates the performance of individual cores while Linpack stresses multi-threaded performance. In both cases the Oppo N1 performed as expected - matching its Snapdragon 600 peers and falling somewhat short of the Snapdragon 800 monsters. Geekbench 3 is about the CPU and memory performance. Here the Oppo N1 posted a surprisingly low result, barely beating the mid-range R819 and coming behind several Snapdragon S4 smartphones. AnTuTu 4 and Quadrant are both compound benchmarks. AnTuTu places the Oppo N1 neck and neck with the Snapdragon 600-yellding Galaxy S4 while Quadrant has a place for the Oppo N1 in the bottom half of the table. GLBenchmark is a GPU benchmark. The off-screen 2.7 and 2.5 tests show the maximum output the Adreno 320 inside the Oppo N1. Here the smartphone got 16 fps and 42 fps respectively, putting the Oppo N1 about on par with the Meizu MX3 and its Exynos 5 chipset. The GLBenchmark's 2.5 test gave the Oppo N1 a very promising result placing it above contenders like the Nexus 5 and well into Adreno 330 territory. Epic Citadel, an onscreen graphics test which accounts for the differences in screen resolution, also points to a fairly highly clocked Adreno 320 inside the Oppo N1, which matched its regional competitor Meizu MX3 exactly. To sum up the Oppo N1 does is a pretty decent performer, even if it won't win any benchmark titles. The good news is that in real world scenarios the Oppo N1 is fast and fluid there are no traces of lag when using it. The app loading times may be a tad better on the Snapdragon 800 handsets, but that's only noticeable if you do side-by-side test. Future proofing is an entirely different subject of course.